For a given type of sludge, temperature conditions will have a marked impact on COD removal efficiency (figure 47). 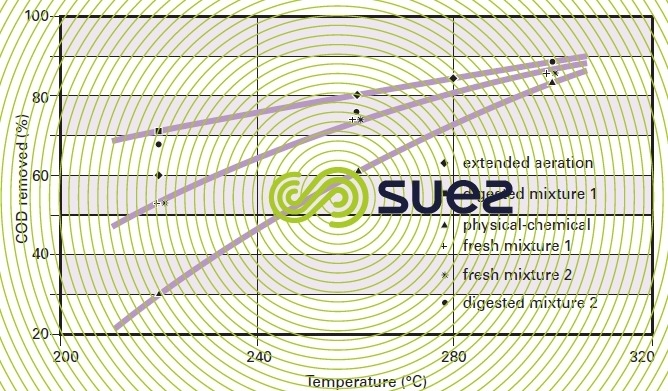 Figure 48 highlights the fact that, with most sludge, there will be a 20 to 40 % COD removal improvement when the temperature is increased from 220 °C to 300 °C (subject to the same reaction time) and that, by working within this temperature range, the efficiency differential between the various sludges will be minor. 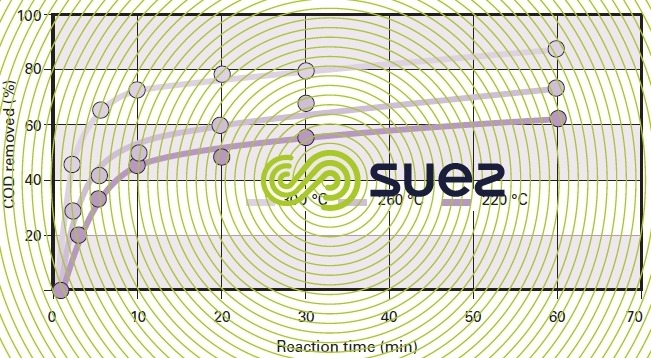 As in the case of any chemical reaction, oxidation kinetics rise with the temperature; however, oxygen solubility also increases by approximately 150 % when the temperature rises from 250 °C to 350 °C (figure 49) and, consequently, the transfer potential increase also causes these reaction kinetics to increase significantly. Therefore, for a given O2 flow rate (i.e. a quantity of processed OM), the greater the pressure increase, the lower the amount of water that is evaporated (good for energy consumption). All these reasons explain why we decided to operate in the region of 300 °C with most sludge when using the Mineralis process. In order to oxidiSe the organic matter contained in sludge, we can use a whole range of powerful oxidants (hydrogen peroxide, ozone, pure oxygen). However, on grounds of cost, we only use air and oxygen. its compression consumes a large amount of electricity combined with equally high compressor maintenance costs. This explains why recent developments systematically use O2 which has also been selected for the Mineralis process. 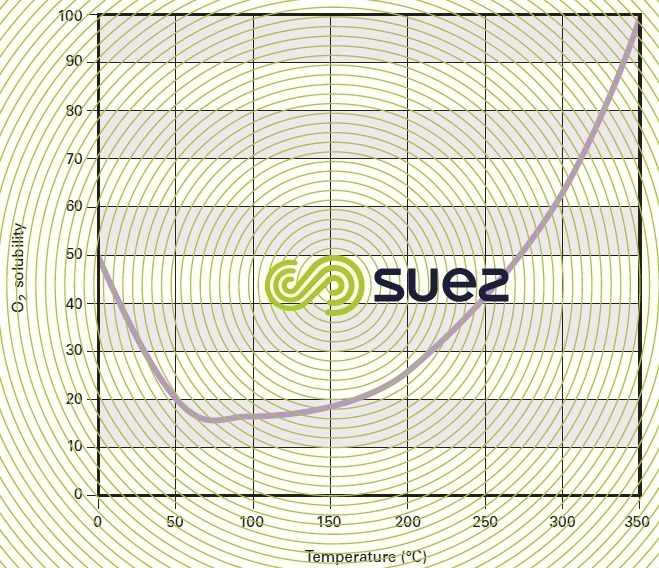 Catalytic processes can be used to reduce the operating temperature inside a wet oxidation reactor. Metal catalysts (Cu SO4) must be mixed in with the effluent to be processed before it penetrates into the reactor. However, we see no value in using this type of catalyst that creates costs that cannot be ignored and that generates a mineral by-product with a high metal content that can restrict its subsequent re-use.